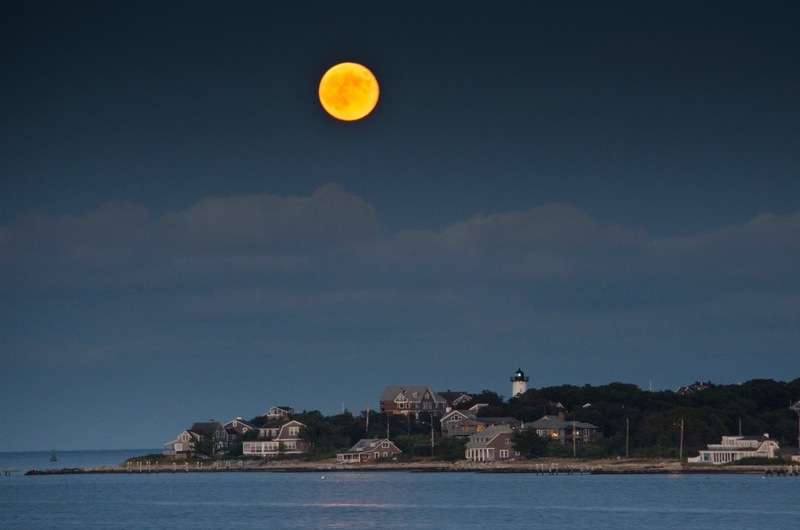 I shot this picture of the full moon from the ferry coming back to Martha's Vineyard. Quite a few people have asked me if I "Photoshopped" the moon. I did not, and would not. I think it's such an unusual perspective that most people have never seen it, and think it must be fake. The moon does not usually look that big in a photograph. Here's my philosophy on altering pictures. Almost all of my pictures are processed in Lightroom 4, an Adobe program that allows me to correct exposures, crop, and tweak colors. I try very hard to recreate what my eye saw, and often that means compensating for the things a camera cannot do. I never add or subtract things from a photo. This was a tough shot because there wasn't much light left, and I had to shoot slow. I was on a boat, where a tripod is useless. I probably shot 30 frames at very low shutter speeds. Most of them were blurred because the camera was moving (on the boat), but this one came out sharp. Purchase this photograph (or at least see what it looks like in a nice frame).